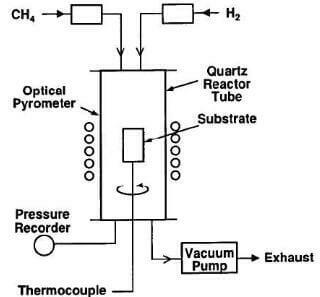 A common CVD apparatus for the deposition of pyrolytic graphite is the so-called cold-wall reactor. This reactor does not require a furnace since the substrate to be coated is heated directly, usually by induction heating. The decomposition reactions for the deposition of pyrolytic graphite are endothermic, i.e., they absorb heat. As a result, deposition takes place preferentially on the surfaces where the temperature is the highest, in this case the substrate, while the cooler walls of the reactor remain essentially uncoated. A simple laboratory type reactor for pyrolytic-graphite deposition is shown in Fig.7.2. The substrate is a molded-graphite disk which is rotated to improve deposition uniformity. It is heated by a high-frequency induction coil and deposition occurs at low pressure. Temperature is monitored and controlled by a sheathed thermocouple and corroborated by an optical pyrometer. Production systems of a similar basic design now reach considerable size, with CVD furnaces 1.2 m in diameter and over 2m high commercially available. Chemical vapor infiltration (CVI): chemical vapor infiltration is a special CVD process in which the gaseous reactant infiltrates a porous material such as an inorganic open foam or a fibrous mat or weave. The deposition occurs on the fiber, and the structure is gradually densified to form a composite. CVI has the same chemistry and thermodynamics as conventional CVD, but the kinetics is different since the reactants have to diffuse inward through the porous structure and the by-products of the reaction have to diffuse out. The process is used extensively in the production of carbon-carbon materials.